For years, I’ve been pondering (mainly on Twitter) one of superhero comics’ odder traits: the relatively high number of Black superheroes that have electrical (or electricity-themed) superpowers. Starting with Black Lightning in 1977 (or possibly Storm, who pre-dates him by two years), we’ve gotten a ton of such superheroes. Some heroes (such as Volt, from Mark Waid and Peter Krause’s “Irredeemable”) point out this tendency, while adding yet another such hero to the list. It’s even a trope on TV Tropes (“Electric Black Guy,” though by no means limited to male characters). Electricity/electromagnetism isn’t a bad superpower by any means. However, being a walking electric company mascot is pretty far down the list of superpowers I’d choose if I had a choice. But why is it overused? Various others online have tried to tackle this question, such as an io9 article, so I thought I’d take a shot. Here’s a list of major Black superheroes who have primary or secondary electrical powers, or whose name/heroic identity ties into such somehow. This is both going off the top of my head and checking sites like Wikipedia and TV Tropes. That’s just for starters. There’s various other characters across all sorts of media. Why so many such heroes? Below, I offer a few possible guesses why there’s such a large number of Black electrical heroes. “Black Lightning: Cold Dead Hands” TPB (2018). Art by Clayton Henry. 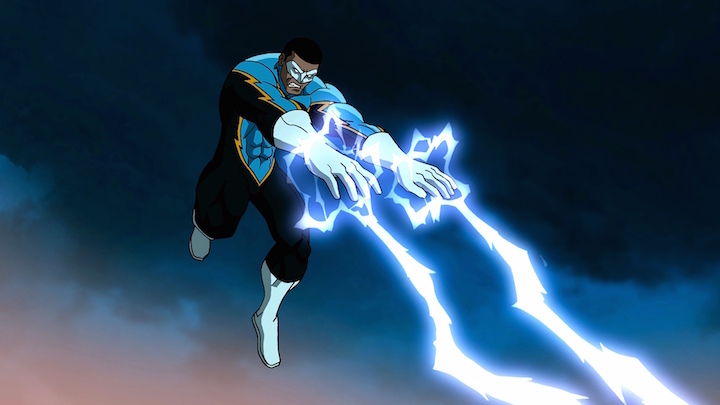 I’ve written before about Black Lightning, who’s usually seen as the center of this trend. Created by Tony Isabella and Trevor Von Eeden in April 1977, Jefferson Pierce is one of DC Comics’ earliest Black superheroes. The aspect of royalties continued to pop up over the years, which led to A) Black Lightning not appearing outside of comics for decades and B) various pastiches appearing in DC-related media instead. For instance, “Static Shock” created the hero “Soul Power” as an older mentor and counterpart to Static. Meanwhile, “Justice League Unlimited” created “Juice,” though Juice was part of a group of heroes that were a pastiche of the non-White ones on “Super Friends.” Thus, Juice is a pastiche of a pastiche? It took until a 2009 “Batman: The Brave and the Bold” episode for the actual Jefferson Pierce to finally appear outside of comics. He’s since been seen in a few other media spin-offs, culminating in getting his own live-action series on the CW in 2018. As Black Lightning is a popular Black superhero, it’d make sense that others wanted to use him—or at least a hero like him—as often as possible. Thus, the various clones of Black Lightning might’ve heavily contributed to the number of Black electrical superheroes. I wonder if another possible factor is the popularity of Storm. Introduced in “Giant-Size X-Men” #1 (May 1975), Ororo Munroe has gone on to become one of the most popular Black superheroes. As a mutant, her powers include various weather-control abilities. 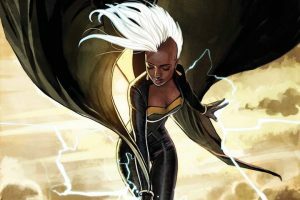 However, Storm summoning lightning has become a popular go-to by writers and artists, when they need to show her attacking powerful foes. This especially seems the case in the various animated and live-action appearances of Storm. And given the large number of non-comics appearances Storm’s made since the 1992 “X-Men” cartoon debuted, she’s now well known among the general (non-superhero-comic-reading) public. So perhaps she’s also influenced the “Black heroes with electrical powers” category? Finally, there’s the third popular Black superhero with electrical powers, Static. Introduced in Milestone Comics in 1993, Virgil “Static” Hawkins became one of that line’s most popular characters. However, Virgil really hit it big with the “Static Shock” animated series, which ran from 2000 to 2004. It’s led to Static making appearances in other subsequent DC-related media, as well as plenty of nostalgia for the cartoon. It’s also reached the point where some people online mistakenly call Static “Static Shock” as a superhero name. 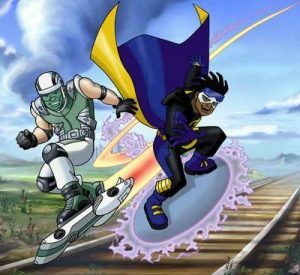 While not as prominent as Black Lightning or Storm, I wonder if Static also helped make Black electrical heroes a popular concept. Electricity is a cool power? Electricity/electromagnetism is a frequently used superpower in superhero stories, so this might be another factor. There’s plenty of electrical-themed superheroes, from Lightning Lad and Lass of the Legion of Super-Heroes to Marvel’s Thor. It’s a very flexible power, especially combined with the equally flexible nature of comic book physics. It looks flashy and impressive on the comics page, as well as in movies and TV shows. And for the latter, it’s likely also an easy/affordable special effect. It’s a powerful, well, power. Sure, Superman (well, most versions) can shrug off lightning, but generally, electrically-powered heroes are considered among the more powerful superheroes for a reason. Overall, there’s a very large number of Black superheroes with electrical powers. 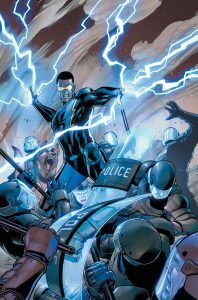 The reasons I can gather for this are: Black Lightning’s a popular and influential early Black superhero, spawning many pastiches; electricity is a popular, versatile and impressive superpower; and possibly also the popularity of Storm and Static. As for whether increased awareness of this tendency will change anything in superhero stories, it’s hard to say. Still, the popularity of Black electrical superheroes like Black Lightning, Storm, and Static doesn’t seem to be waning anytime soon. As of this writing, Black Lightning the featured team-up in this month’s “Scooby-Doo Team-Up,” plus his CW series is in the middle of its second season.